The fourth graders take one all-day field trip to Jefferson, Texas. The trip reinforces some of the topics we cover in history and science. We take a pontoon ride down the bayou, and listen to Mr. Nance talk about the area's history and nature. That is followed by a wagon ride past some historical sites, like the house Lady Bird Johnson stayed at while she lived with her aunt and attended high school. We go to the Museum of Time and Measurement. The students are fascinated by some of the items, and the gentleman who owns the collection is always eager to teach the students. His enthusiasm is shared by our fourth graders. We have lunch at the General Store. Before we take the trip we discuss the role in the community that a general store once played. This store is a little different, but the students can see how it might have functioned a century ago. Jefferson is a fun and educational place to visit. We are very fortunate to have a parent who is an engineer for the Texas Department of Transportation. For the last six years she has been coming to do an engineering workshop with our fourth graders. This has worked out very well because it is very interactive, and the fourth graders really love the activities. The students learn about different types of careers in engineering. Then they learn that there are for basic steps in engineering. 1.) Define a problem that you need to solve. 2.) Brainstorm possible solutions. 3.) Develop your plan or solution. 4.) Test it out. The fourth graders use these steps to try and build a six inch high table using only eight pieces of newspaper, a piece of 8” by 11” cardboard, and some masking tape. The table has to be able to hold a heavy book, like a dictionary. One of the three groups succeeded the first time. The other two groups needed to go back and revise their plans. We also discuss the materials on roadways and why some work and some don’t. Then we tried making a no-bake cookie. If we followed the directions, our cookies worked out well. If we vary the materials by very much, they aren’t as successful. We also watch a video of a bridge imploding (always a favorite with 4th graders). We are shown some of the tools that are used in planning road construction and some of the materials used. Students are always amazed at the size of stop signs and the reflective stripes that go down the interstate. It is a very educational and rewarding experience for all of us. After studying immigration to America, and specifically Texas, the fourth graders did a culminating project on different cultures. This illustrated what was once called “The Melting Pot” and is now referred to as “The Salad Bowl” of cultures in America. Each student researched a country and wrote one-paragraph reports on a variety of topics. Most of the grade for this project was based on writing a good paragraph, so we could integrate our social studies into our language arts program. It took us nearly four months to do all the research and type up acceptable paragraphs. Not only did the students need to use good sentences and proof read well, they were required to paraphrase so that nothing could be construed as plagiarism. Finding material that fourth graders can understand and rewrite in their own words is a difficult task. Then, being able to put the information in a good paragraph takes a number of language arts skills. While in lower school, it is acceptable to have parents assist students, our goal in middle school is to teach the students to become independent learners. All of the reports must be written in class. As a reward for their hard work, the students held a fair to share what they learned with the rest of the school and our school community. We had a wonderful time learning. The fourth graders read an abridged version of Treasure Island. We read some chapters from the original version, so that the students can understand what is meant by an abridged or condensed version of a book. The original version of Treasure Island would be more appropriate for seventh or eighth graders. Fourth graders reading the original version would have difficulty understanding the vocabulary, word usage, and the connotations of some of the words. Because of cultural difference, even the abridged version requires some explanation. After finishing the book, the students used a form to make a book report / review of Treasure Island. The students were required to try and identify the main idea, the lesson taught, the main characters, the conflict, the resolution of the conflict, the main setting, the beginning, middle and end of the story, and the difference between a report and a book review. Those are a lot of concepts for fourth graders. Adam’s grandmother brought a book report she had done in 7th grade on the book Treasure Island. We compared it to the one that Adam just finished. That was a great coincidence. This year, St. James is celebrating a 70th anniversary. As part of that celebration, the fourth graders are celebrating our grandparents’ birthdays. We are sending a card to each of the grandparents for which we have a mailing address. The first card we mailed was to New York. That grandmother responded with a really cute stand up silhouette card. The second grandmother lives locally, and came to visit the class. She was born on Veterans Day, so she came and talked about growing up and celebrating Veteran’s Day in the 40’s and 50’s. She brought some of her childhood treasures, including a Girl Scout doll and an illustrated book report she did in 7th grade. The book report was on Treasure Island, which we just finished reading in the abridged form. We are doing an illustrated book report, but not as elaborate as the one she did. Our third birthday card went to a local grandfather, who consented to come speak. He brought a ventriloquist dummy that he used as his talent in a high school show. He showed us how to make a candle lantern that he made in Boy Scouts, and among other stories, he shared some pictures of himself as a young boy. This could prove to be my favorite project of my over forty years of teaching. 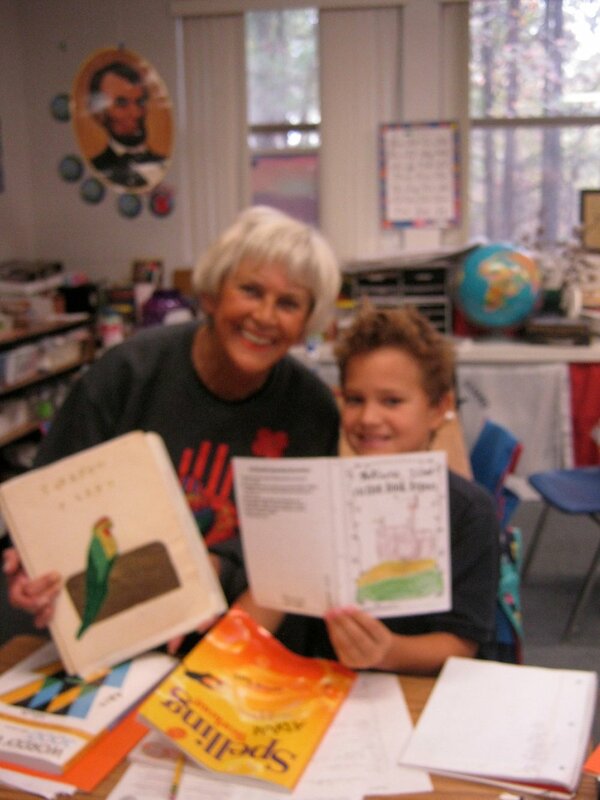 The students are learning about the great educational resource they have in their grandparents. We are all enjoying the visits and correspondence.